Officials Blame Terrorists For Mumbai Explosions : The Two-Way Mumbai is on high alert after three explosions were reported in high-traffic sections of India's business capital, striking in the early evening. According to the AP, the city's Police Control Room says that all three blasts took place in a crowded markets and busy areas. Indian medical staff attend to an injured patient as he arrives at The JT Hospital in Mumbai. -- The explosions detonated between 6:50 p.m. and 7 p.m. local time. -- The Hindu reports that Prithviraj Chavan, the top official in the state of Maharashtra, where Mumbai is located, said at least 17 people are dead and 81 others injured. -- The AP reports that "India's Home Minister Palaniappan Chidambaram said officials believed 'it was a coordinated attack by terrorists.'" 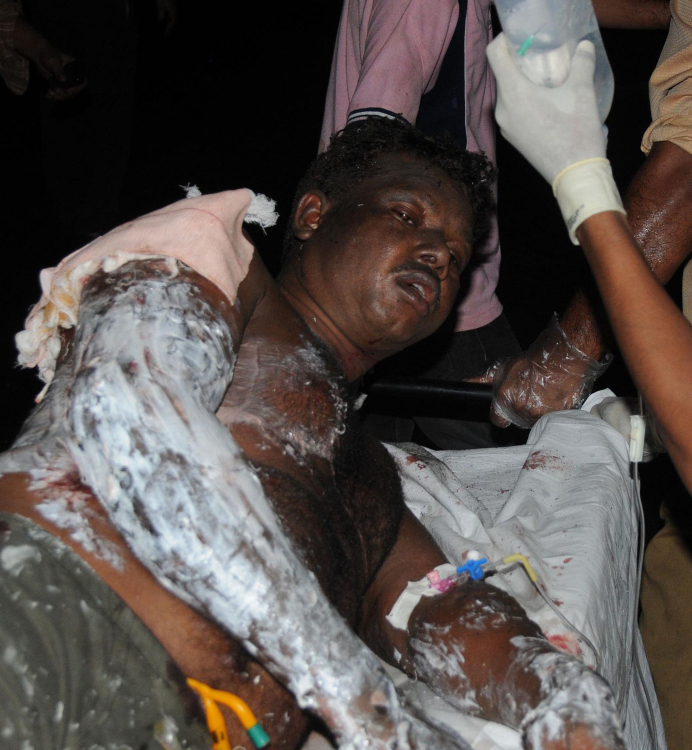 Chidambaram said the close timing of the explosions signaled that. -- IBN, an Indian cable news station, reports that improvised explosive devices were used at all three locations. -- IBN adds: The first blast occurred in South Mumbai, near the Mumbadevi temple. The second was in a taxi in the Dadar area, and the third near the Mumbai Opera House. Update at 6:48 p.m. ET. Who Did This? The big question that remains unanswered at this hour is who was behind the attack? As we noted earlier, Pakistan very quickly issued a statement condemning the attacks. The AP talked to Karl Inderfurth, a U.S.-India policy expert at the Center for Strategic And International Studies, who said that at this point in India and Pakistan's history, it would be unlikely that Pakistan would be provoking a crisis. He said he "can't conceive" that that would be case. I strongly condemn the outrageous attacks in Mumbai, and my thoughts and prayers are with the wounded and those who have lost loved ones. The U.S. government continues to monitor the situation, including the safety and security of our citizens. India is a close friend and partner of the United States. The American people will stand with the Indian people in times of trial, and we will offer support to India's efforts to bring the perpetrators of these terrible crimes to justice. During my trip to Mumbai, I saw firsthand the strength and resilience of the Indian people, and I have no doubt that India will overcome these deplorable terrorist attacks. The Hindu reports that the scene at all three explosions was one of chaos. In one case, the explosion was so loud an eyewitness said he thought a building had collapsed. Another witness said the explosion could be heard from as far as one kilometer. Others described scenes in which the blasts created so much smoke that "there was complete darkness..."
A diamond trader near the Opera House explosion said the blast carried "a sleet of shattered glass inside." Jayesh Labdhi, another witness, said he thought the blast at the Zaveri Bazaar was gunfire, then he saw people running and saying it was a bomb. He said he took 14 to 20 people to the hospital and "30 lying around with injuries." Some of pictures that have moved on the wire show bodies strewn across bloodied streets and authorities sifting through charred remains. Others show survivors badly injured. "President Asif Ali Zardari, Prime Minister Yousuf Raza Gilani, the government and the people of Pakistan have condemned the blasts in Mumbai and expressed distress on the loss of lives and injuries," said a statement issued by Foreign Office spokesperson Tehmina Janjua. "The President and the Prime Minister have expressed their deepest sympathies to the Indian leadership on the loss of lives, injuries and damage to property in Mumbai," Ms. Janjua said. No one has yet claimed responsibility for the attack, but the last major terrorist attack in Mumbai was the work of 10 Pakistanis, who killed 166 people in a Nov. 2008 attack on Mumbai. Update at 10:58: India's home ministry says it believes the attacks are the work of terrorists. Earlier, local officials held out the possibility that the blasts were part of gang violence. The AP reports that 70 people were injured, and 8 killed, in the attacks. Earlier reports said that 10 people were killed. Exact casualty figures have been hard to come by, and are likely to continue to fluctuate as reports come in. At least 50 people were injured in the rush-hour attacks in which three bombs detonated at 6:30 p.m., 6:45 p.m., and 7 p.m. local time, according to NDTV. And police say that the bombs were improvised explosive devices. One explosion, in a car at a bus stop in Dadar West, has been confirmed. A police officer said there might have been an explosive in a meter box behind a hoarding at Khau gali, a street filled with eateries at Zaveri Bazaar. Mumbai is on high alert after three explosions were reported in high-traffic sections of India's business capital, striking in the early evening. According to the AP, the city's Police Control Room says that all three blasts took place in crowded markets and busy areas. One device was planted in a meter box, according to ongoing live coverage on NDTV. The blasts targeted Dadar and Zaveri Bazaar, where reports suggest one device was inside a jewelry shop. The busy Opera House region also appears to have been struck. Reuters says that at least 15 people have been injured. In 2008, Mumbai was attacked by armed militants; in that attack, more than 150 people died.